The pine tree is a popular bonsai. With more than 100 species, the pinus family provides a bonsai for every enthusiast, from novice to expert. This is a hardy and adaptable tree that adjusts well to pruning and training. Though tolerant, the pine bonsai requires generous attention, and its maintenance differs slightly from most bonsai selections. Select a healthy, young pine tree with rich colored foliage and an undamaged root system. Select pines such as the Japanese black pine or the mountain pine; these pines can withstand a wide range of temperature variations. Pick a well-drained potting container for your pine. Select a container with a depth that is equivalent to the trunk's diameter and a width that is about 2/3 the height of the tree, recommends Bonsai4me. Prepare a well-drained soil mixture for your pine bonsai. Incorporate two parts coarse sand or grit with one part pure sphagnum and one part clean pink bark, the Bonsai Gardener suggests. Line the bottom third of your potting container with a layer of soil mixture. Position your pine bonsai in the center of the container and fill the container with soil. Always make sure all of the pine's roots are covered. Secure the tree’s upright position by pressing the soil firmly around the tree. Water your newly planted pine bonsai thoroughly until the water flows evenly from the drainage system. Allow your pine bonsai to dry out slightly between irrigations to prevent overwatering. Rather than irrigating on a schedule, check the pine bonsai’s soil moisture levels first and irrigate when the soil feels somewhat to nearly dry. Keep your pine bonsai in a warm, sunny location that receives at least eight hours of full sunlight each day. Choose a well-ventilated location that rests away from sources of direct temperature variations, such as patio grills and air conditioners. Prune your pine bonsai to maintain its health and develop the desired shape. Take time to understand your pine bonsai’s growth pattern before pruning, Bonsai4me says. Hard prune your pine bonsai in the late fall, after the growing season. Remove dead and damaged branches with sharp, sterile pruning shears. Reduce the shape and size of the bonsai across several growing seasons to prevent growth stunt and permanent injury. Reduce the pine bonsai’s candles in the early spring. Remove the largest, dominant candle of each candle cluster to promote smaller branches, according to Japanese Gardening. Complete the process by gently snapping the candle from the cluster. Thin the interior needles by gently snapping them from the branch to promote air circulation and light penetration throughout the tree. Complete the thinning process after each flush of growth. The frequency varies based on each individual pine, so watch your pine bonsai carefully to understand its growth pattern. Feed your pine bonsai in the early spring, according to the Bonsai Gardener. Select a slow-release 0-10-10 or a well-balanced 10-10-10 combination. Distribute the feed equally throughout the bonsai at half strength and irrigate it thoroughly into the soil. Allow the new growth that occurs after the fertilization to harden in texture and darken in color before fertilizing again. 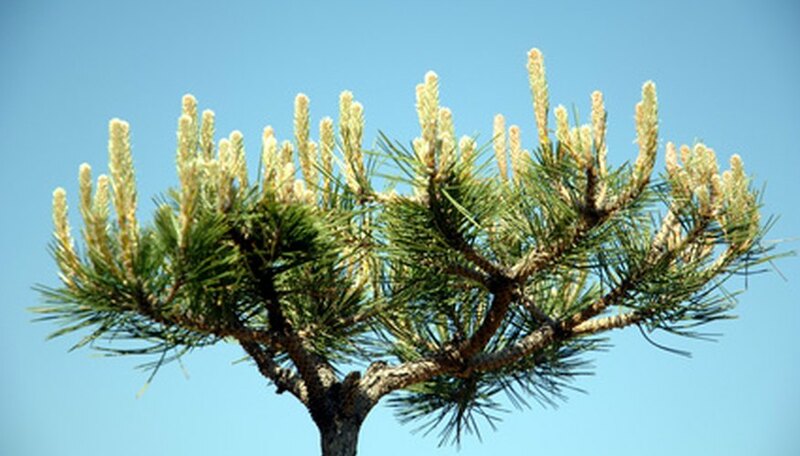 Cease feeding applications during your pine bonsai's dormancy period. Repot your pine bonsai every two to three years.